WHAT IS IT? The Model PC is a rugged safety switch that provides a quick positive shut off of dangerous equipment in emergencies or normal operation. It is actuated by cable pulled by endangered personnel. The output contacts of the Model PC can control up to two separate circuits, one for machinery shutdown and one for alarm. WHY IS IT NECESSARY? Safety minded operators of conveyors, production lines, elevator equipment, assembly lines, material handling systems, cranes, etc. consider it a must for employee protection. 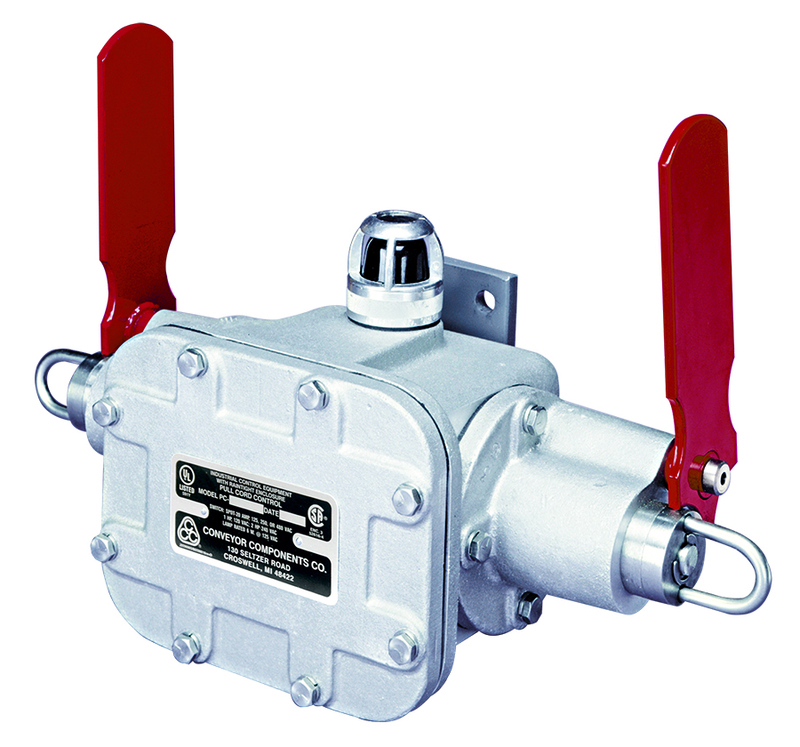 Most states have safety statutes that require these switches on conveyors and related equipment. American National Standard Institute recommends their use in ANSI standard No. ASME B20.1 - 2012-5.11. This ANSI standard will probably soon become part of the William-Steiger Act of 1970- the OSHA act. NOTE: Explosion proof units meet (NEMA 7) Class I, Groups C & D and (NEMA 9) Class II, Groups E, F & G for hazardous locations. NO ADDITIONAL CHARGE. Add suffix "X" to end of standard (general purpose) model number for explosionproof version. 16 pound pull force is standard, however 25 pound pull force is available upon request. Add "-25" to the end of the model number. Optional 120 VAC warning light available (requires two microswitches per end to function), add suffix "L" to model number: add $177.00 per unit. Optional LED bulb available for lighted models: add $37.00 per unit, add "LED" to end of model number. Typical cardboard shipping carton measures 11" x 9" x 8" for single-ended units, or 17" x 11" x 8" for double-ended units. PC-25 3/32" Orange Vinyl Coated Cable, 3/16" O.D. (price per foot)* 32 lb./1000 ft. $0.46/ft. PC-26 3/32" Orange Nylon Coated Cable, 3/16" O.D. (price per foot)* 32 lb./1000 ft. $0.84/ft. PC-27 Cable Support Eyebolt, 1/2" X 6"
(Optional) Epoxy coated units with standard flag arms and plated torsion springs. Add suffix "E" to end of model number for epoxy coating. Use our red warning light in dark or remote areas (requires two microswitches per end of housing) 120 VAC. NOTE: Available in rain-tight, dust-tight, or explosion proof. The housing is cast aluminum, with optional epoxy or polyester powder coating available (for additional corrosion resistance). Single ended units are actuated via a cable pull from one direction, while double-ended units can be actuated from either or both directions. The model PC units come standard with a 16 lb. pull force, however units can be manufactured with a 25 lb pull force. Add "-25" to the end of the model number. The unit is mounted on the conveyor by drilling (4) 13/32" diameter holes. General purpose (weatherproof) units and explosionproof units have (2) 1" NPT conduit openings. The units with "S" type microswitches (SP/DT) have dry, unpowered microswitch(es) rated for 20A @ 120 VAC, 240 VAC, and 480 VAC. The units with "T" type microswitches (Two-Circuit Double-Break) have dry, unpowered microswitch(es) rated for 15A @ 120 VAC, 240 VAC, 480 VAC and 600 VAC. Highly visible red polyester powder coated flag arm for quick identification of actuation. Optional red warning light available for dark or remote locations. The ambient temperature range is -22ºF (-30ºC) to 104ºF (40ºC). The general-purpose units are rated NEMA type 4/4X weatherproof and corrosion-resistant. Explosionproof units are rated NEMA type 7/9 for dust ignitionproof and vapor explosion proof. The special dual-rated "D" units meet NEMA type 4 weatherproof, NEMA type 4X corrosion resistant, and NEMA 9 type dust ignitionproof. Most models are UL listed and/or CSA certified.